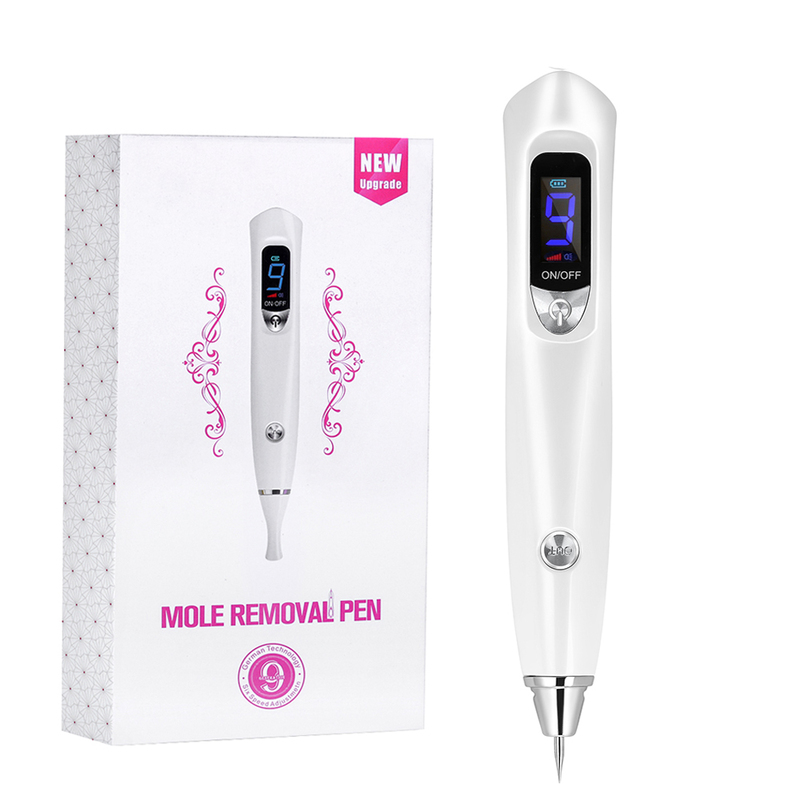 This mole removal plasma pen produces high-voltage micro-current when working, it will produce current spark to make skin carbonization and remove freckles & moles on human's skin. 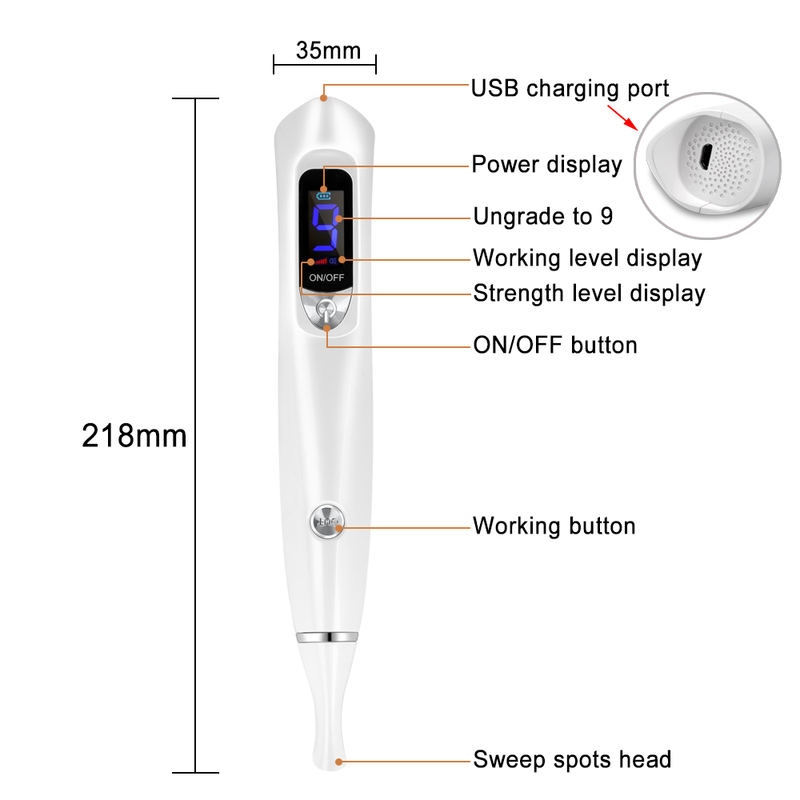 1.Micro Current Technology: using the latest high-tech, contolled by microcomputer.Safe,convenient and fast. 2. 9 Power Levels: by using 9 adjustable power output levels, smart and reliable. 3. 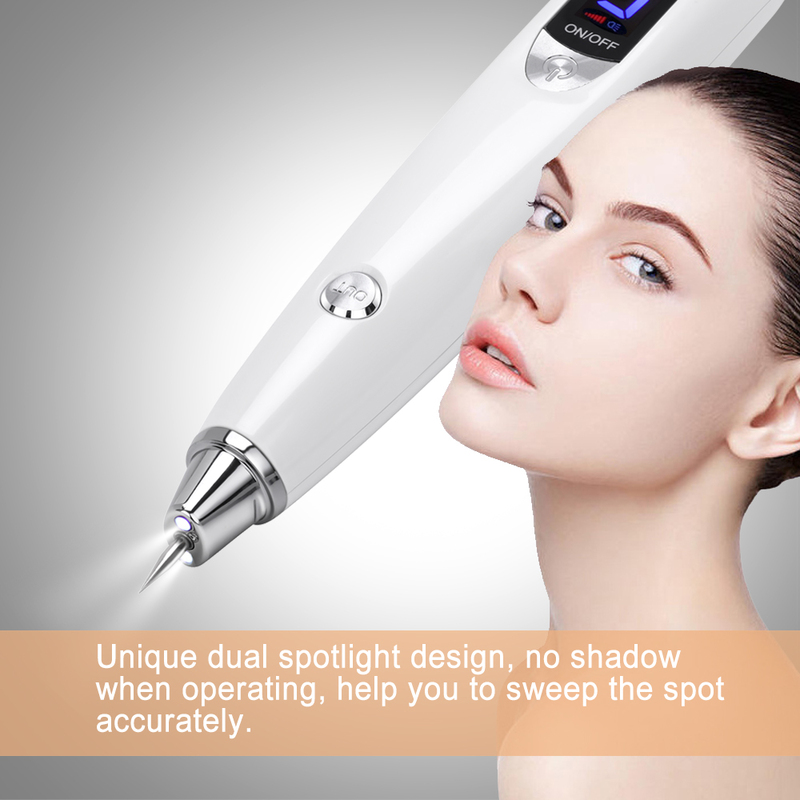 Dual spotlight: no shadow, easy to use. 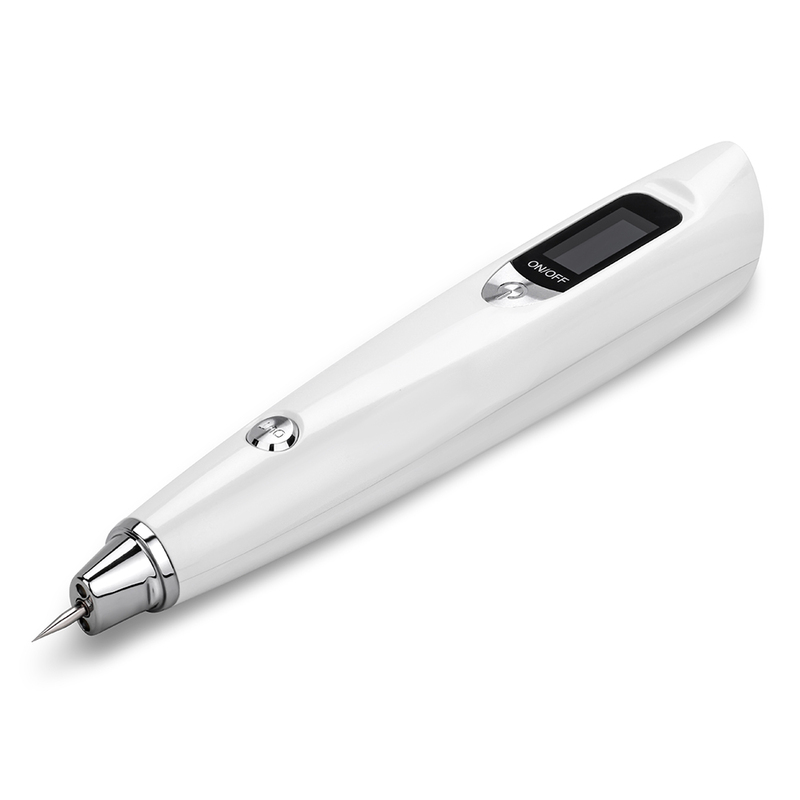 4..Electric Ion Technology: the unique ion technology will not let the user feel the electric current during using,no bleeding. 5. 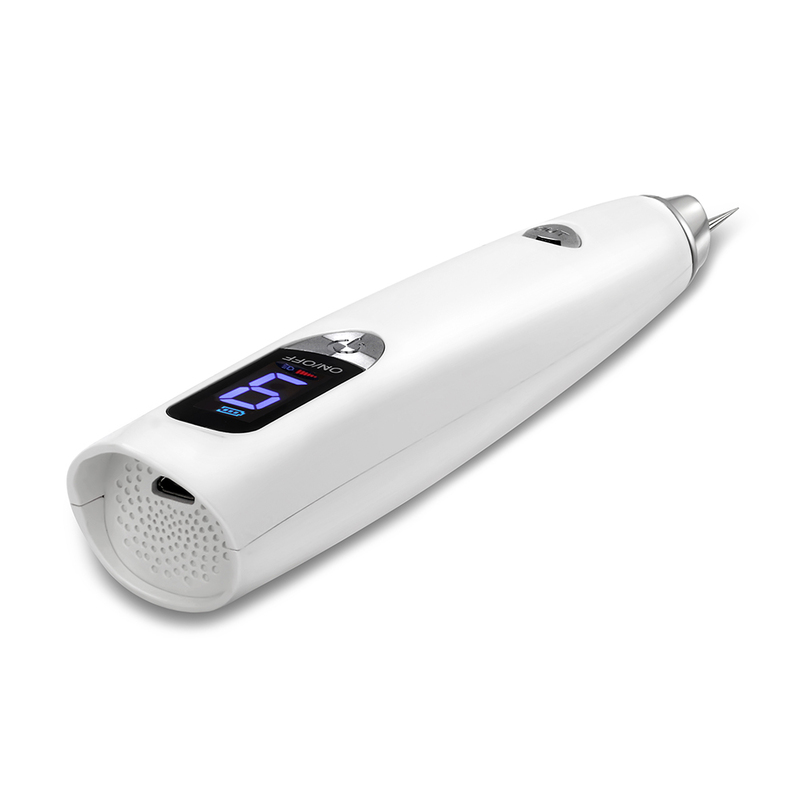 Rechargeable: a single charge can be used more than 5 hours continuously. Convenient and easy to carry. 1. Long press ON/OFF button for about 2 second to power on. 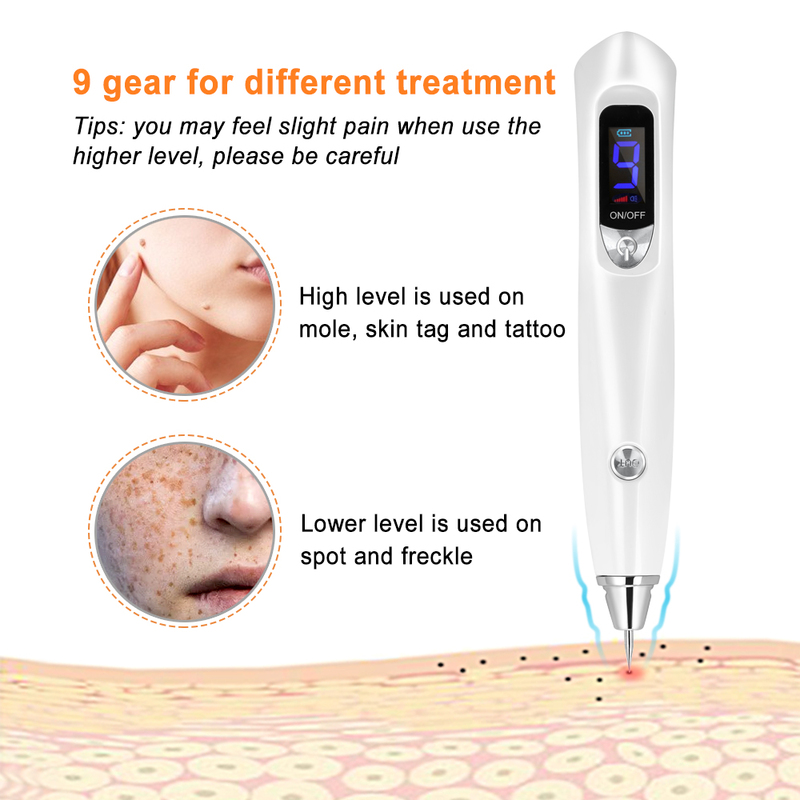 level 3 to remove the shallow freckle with small area, and using the speedabove level 3 to remove the bad freckles in large area. display the working status in the button of the screen. operation area. 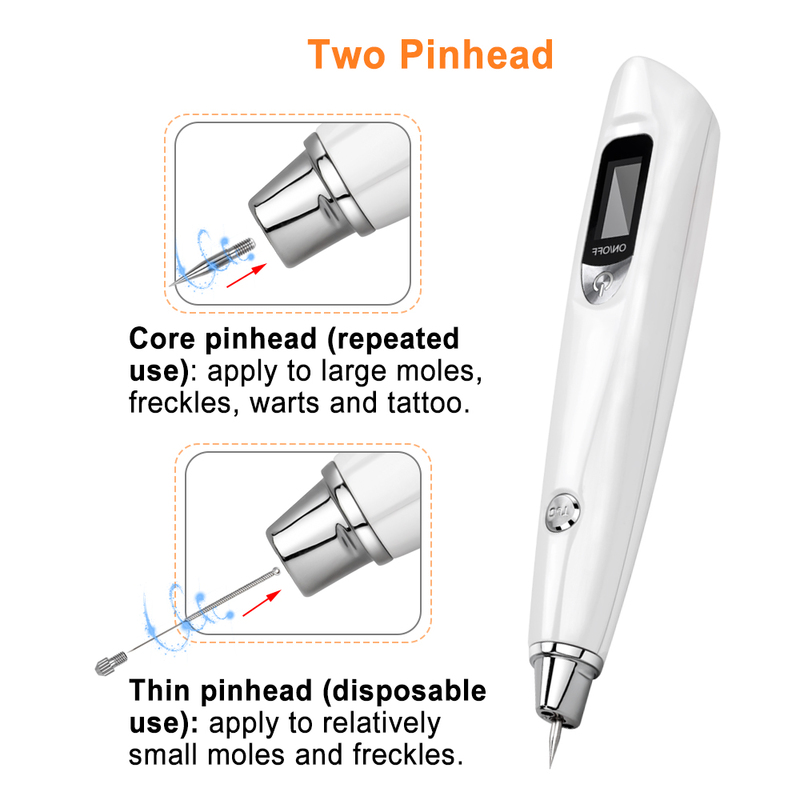 The pinhead of the unit gently point contacts freckleson skin. It will produce sparks when a pinhead touches the skin. fingers to support the operation area. Gently sweep at the freckle backand forth and do not stay for too long at one freckle. It will producesparks when a pinhead touches the skin. It is better to sweep flat, soas not to burn the skin. 4. Remove the spots with a cotton swab,and the melanin is removed. 1. Disinfection the needles before use. 2. 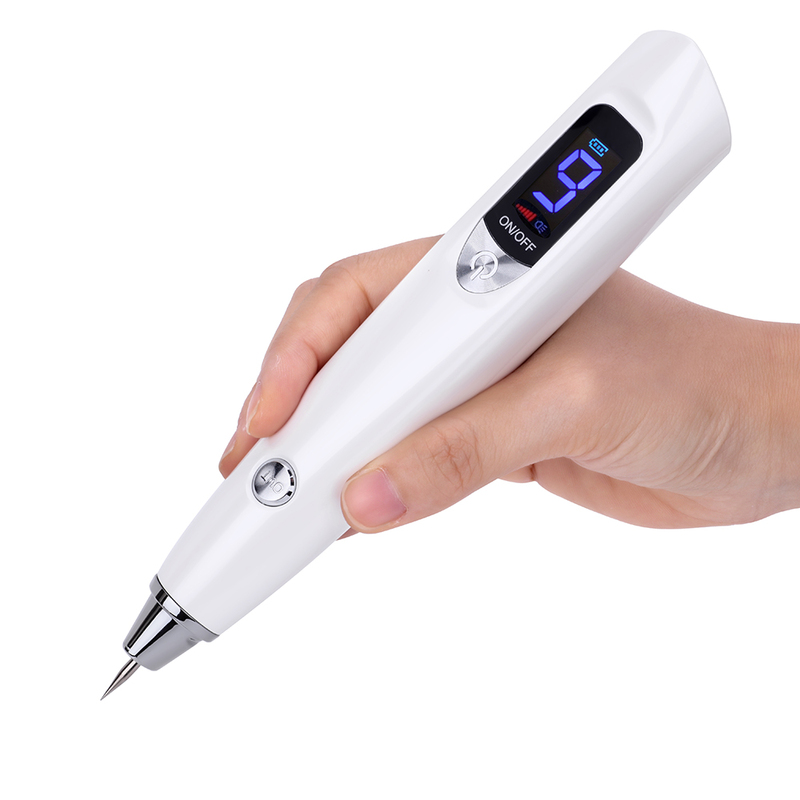 Adjust a suitable tolerance mode level as you need for different skin area, start at the lowest level. 3. Gently evenly sweep the skin blemishes. Carefully use little effort when remove skin small blemishes; stronger effort when remove skin large blemishes. 4. 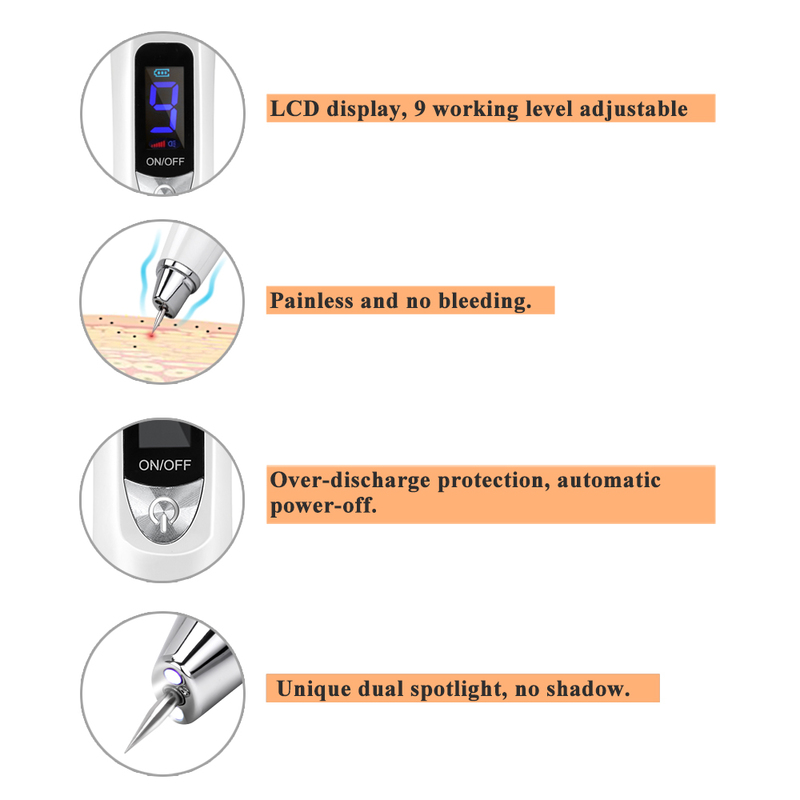 Serious and hereditary skin blemishes problems are recommended to be treated in the hospital. 4. 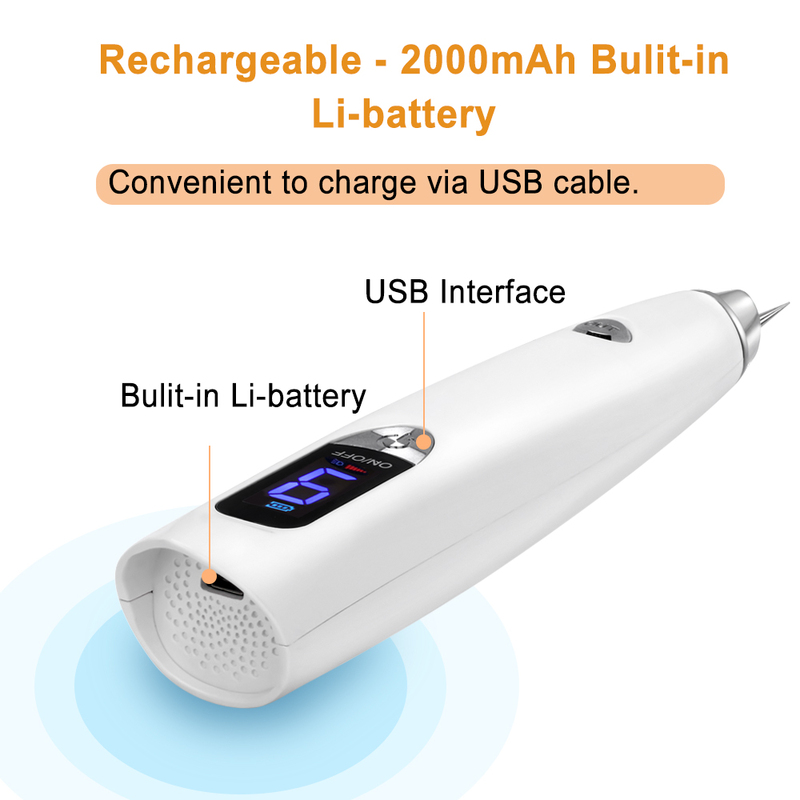 The device need to charge every 3-4 months if not use. 2. The machine need to operate under professional person. For special nevus and freckle, need to operate under the doctor control. 3. Avoid Children and Non-Professional. 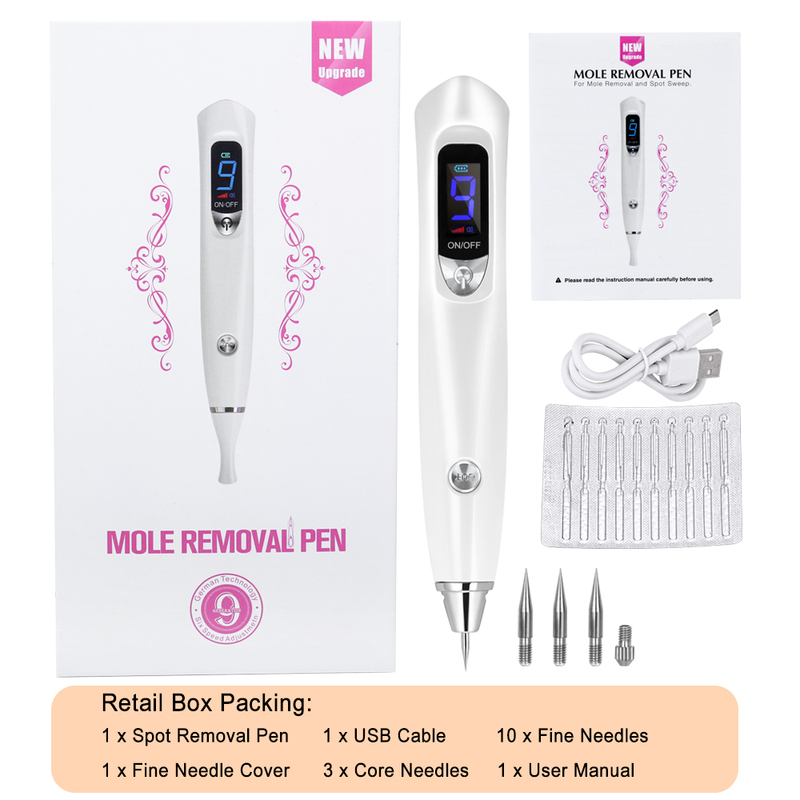 The needles is Disposable, If you need the extra needles, please check here Replacement Needles for Mole Spot Tattoo Laser Removal Pen.